For the 16th-century poet, see Garcilaso de la Vega (poet). 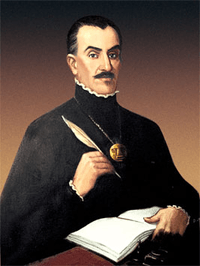 Garcilaso de la Vega (12 April 1539 – 23 April 1616), born Gómez Suárez de Figueroa and known as El Inca or Inca Garcilaso de la Vega, was a chronicler and writer born in the Spanish Empire's Viceroyalty of Peru. Sailing to Spain at 21, he was educated informally there, where he lived and worked the rest of his life. The son of a Spanish conquistador and an Inca noblewoman born in the early years of the conquest, he is recognized primarily for his histories about Inca history, culture, and society. His work was influential and well-received. It was as the first literature by an author born in the Americas to enter the western canon. After his father's death in 1559, De la Vega moved to Spain in 1561, seeking official acknowledgement as his father's son. His paternal uncle became a protector, and De la Vega lived in Spain for the rest of his life, where he wrote his histories of the Inca culture and Spanish conquest, as well as an account of de Soto's expedition in Florida. The coat of arms of Garcilaso de la Vega. Born Gómez Suárez de Figueroa, in Cusco, Peru, in 1539, he was the illegitimate son of a Spanish aristocrat and a royal Inca mother. He was born during the early years of the Spanish conquest. His father was Spanish captain and conquistador Sebastián Garcilaso de la Vega y Vargas (d. 1559). His mother was an Inca princess, Palla Chimpu Ocllo, who was baptized after the fall of Cuzco as Isabel Suárez Chimpu Ocllo. She was descended from Inca nobility, a daughter of Túpac Huallpa and a granddaughter (not a niece) of the powerful Inca Tupac Yupanqui. Because he was illegitimate and the ravages of the conquest were underway, the boy was given only his mother's surname. Under the Spanish system of caste that developed, he would have been classified as a criollo (for being of Spanish descent, born in South America) and mestizo (for his mixed parents). Gómez lived with his mother and her Inca family for the first ten years of his life. His first language was Quecha, but he also learned Spanish from his early years. His father took the boy into his household and gave him some education. Suárez de Figueroa received an inheritance when his father died in 1559. The next year, at 21, he decided to travel to Spain. When Gómez was young, his father had abandoned his mother and officially married a younger Spanish woman. De la Vega's mother Palla Chimpu Ocllo married Juan de Pedroche and had two daughters, De la Vega's half sisters. Ana Ruíz married her cousin Martín de Bustinza, and Luisa de Herrera married Pedro Márquez de Galeoto (one of their children was Alonso Márquez de Figueroa). Suárez de Figueroa reached Spain in 1561 while there was still fighting in his native country under the conquest. The Spanish did not achieve their final victory until 1572. He traveled to Montilla, where he met his father's brother, Alonso de Vargas, who acted as the young man's protector and helped him make his way. The younger man soon traveled to Madrid to seek official acknowledgement as his father's son from the Crown, and he was allowed to take the name of Garcilaso de la Vega. Also referred to as "El Inca" or "Inca Garcilaso de la Vega", he received an informal education in Spain. Together with his uncle's support, gaining his father's name helped him in society. Baptized and reared as Christian, he portrayed Incan religion and the expansion of its empire from a viewpoint influenced by his upbringing. He did not acknowledge or discuss the human sacrifices that are now known to have been part of Inca practice. It is unknown whether that was an effort to portray his Inca ancestors in a more positive light because of he knew about Spanish views or his ignorance by living most of his life in Spain. De la Vega's first work was La Florida del Inca, an account of Hernando de Soto's expedition and journey in Florida. The work was published in Lisbon in 1605 and became popular. It describes the expedition according to its own records and information Garcilaso gathered during the years. He defended the legitimacy of imposing the Spanish sovereignty in conquered territories and submitting them to Christian jurisdiction. At the same time, he expresses and defends the dignity, the courage, and the rationality of the Native Americans. It was translated and published in English in 1951. Historians have identified problems with using La Florida as an historical account. Jerald T. Milanich and Charles M. Hudson warn against relying on Garcilaso, noting serious problems with the sequence of events and location of towns in his narrative. They say that "some historians regard Garcilaso's La Florida to be more a work of literature than a work of history." Lankford characterizes Garcilaso's La Florida as a collection of "legend narratives," derived from a much-retold oral tradition of the survivors of the expedition. The Library of Congress in Washington, DC, has these two volumes online, scanned from a historic French-language edition published long before English editions. While in Spain, Garcilaso wrote his most well-known work, Comentarios Reales de los Incas, published in Lisbon in 1609. It was based on stories and oral histories told by his Inca relatives when he was a child in Cuzco. The Comentarios have two sections and volumes. The first was primarily about Inca life. The second, about the Spanish conquest of Peru, was published in 1617. It was first published in English in London in 1685, translated by Sir Paul Rycaut and titled The Royal Commentaries of Peru. More than a century and a half later, in 1758 when the uprising against colonial oppression led by Tupac Amaru II gained momentum, Charles III of Spain banned the Comentarios from being published in Quechua language in Lima or distributed there for its "dangerous" content. Schreffler, Michael J. and Jessica Welton. "Garcilaso de la Vega and the 'New Peruvian Man': José Sabogal's frescoes at the Hotel Cuzco," Art History 33, (January/February 2010): 124-149. 1 2 3 Libros Peruanos. "Inca Garcilaso de la Vega." ↑ Milanich, Jerald T.; Hudson, Charles (1993). Hernando de Soto and the Indians of Florida. Gainesville, Florida: University Press of Florida. p. 6. ISBN 0-8130-1170-1. ↑ Lankford, George E. (1993). "Legends of the Adelantado". In Young, Gloria A; Michael P. Hoffman. The Expedition of Hernando de Soto West of the Mississippi 1541–1543. Fayetteville, Arkansas: University of Arkansas Press. p. 175. ISBN 1-55728-580-2. Retrieved 16 November 2013. ↑ Rycaut, Paul (1685). The Royal Commentaries of Peru. Miles Flesher/Christopher Wilkinson.